With the sheer amount of software being created today, software development techniques are rapidly and continuously evolving. Even industries that previously had a very fixed cycle, such as car manufacturers, are moving towards continuous delivery. As more companies adopt an Agile development process to support continuous delivery, testing (or quality assurance) and delivery need to keep pace. Hence, the rise of DevOps, which manages the entire product lifecycle. But, there are varying levels of DevOps. In this post, we define those levels and share with you our approach. How does your enterprise measure up? 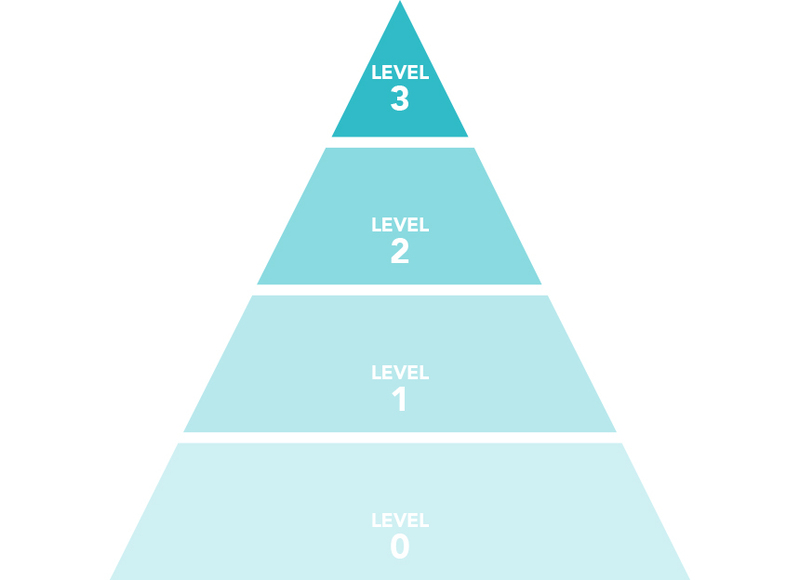 At Level 0, there’s no automation whatsoever. Developers in this category build applications manually, then package and store them in a shared location. Deployment is a manual process through production machines. In extreme cases, developers send deployments directly into production machines, sometimes simply overwriting files in a production environment. Rollback, in this case, is manual and often not even possible. Rolling deployments are difficult—nearly impossible. Disaster recovery is also a manual and lengthy process. Self-healing is impossible, as infrastructure is handled manually. Typically, non-software development companies would live here. Projects are small and usually delivered by lone contractors. Level 0 is suitable when there is intermittent deployment with minimal need for updates. For all other enterprises, Level 0 is not a great place to be. Level 1 improves on Level 0. Building and packaging is done automatically by the build server. The artifact produced is easily traceable from where it originated. The build runs unit tests to verify consistency. Artifacts are placed into a shared repository for application support to pick up. Deployments are still carried out manually by application support, following repeatable procedures. However, as with Level 0, rollback is manual and often not possible. Rolling deployments are difficult—nearly impossible. Disaster recovery is also a manual and lengthy process. Self-healing also is impossible, as infrastructure is handled manually. Most modern software development is in this category. Level 1 allows developers to quickly build packages and pass them on for application support to deploy. This is suitable for companies that have a low number of products with minimal changes. Here, the building, packaging and deploying for all environments is automated. Following deployment, integration tests can verify the build. Code changes automatically trigger builds, unit tests and deployments to the integration environment with the ability to promote builds to successive environments. Infrastructure is not yet automated, however. Machines are prepared manually before builds are set. In Level 2, rollback is possible by deploying the old version of a build. Rolling updates are difficult to set up and are application-specific. Disaster recovery is manual. It’s also time consuming, as infrastructure needs to be manually rebuilt to a specific state. Self-healing at this stage also is impossible, as infrastructure is handled manually. This is where most companies with multiple products and teams are trying to get. Level 2 allows teams to quickly deploy new versions of a product for clients to use. Deployment automation reduces the potential for error. With manual tasks automated, the workload of application support is reduced—they’re no longer a bottleneck. This category is ideal for companies that have multiple teams working on products with frequent, rolling changes. Level 3 features full infrastructure automation, builds and deployments. When a deployment is complete, the new required infrastructure is created and a new build is deployed. Tests verify the consistency of a deployment, allowing for green/blue deployments. The rollback is simply switching back to an old infrastructure or rebuilding it from scratch in an automated way. Disaster recovery easily becomes a new deployment that rebuilds infrastructure and redeploys the application. At this level, self-healing is possible as infrastructure is scripted and can be rolled out automatically as soon as any erratic behavior is detected. This is where SaaS companies should be. The full automation at Level 3 allows for uninterrupted service and continuous feature improvements. This approach works well when there’s support from an SVP and training is facilitated in parallel both top down and bottom up. The needed level of DevOps prowess differs from organization to organization. With an increasing demand for software that evolves with its users, embracing DevOps can give enterprises a leg up on the competition.